The Orange Stockholm manual aka user guide available for download in pdf format directly at orange.co.uk. The Orange Stockholm manual has 69 pages with file size is 6.62 MB and support in english language. In the Orange Stockholm user guide, you can find information and learn about phone mobile layout with key and menu functions, calling tutorial, using the Onscreen Keyboard and contacts, messaging settings, connecting guide and using applications. Further about google services, managing mobile phone, phone setting guide and more. While for table of content from the Orange Stockhol owner manual and download link read after pictures below. 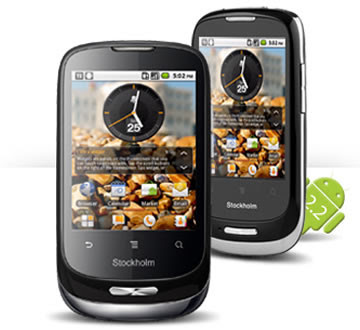 The Orange Stockholm runs on the Android 2.2 (Froyo) operating system. It has 2.8-inches QVGA TFT capacitive touchscreen display with 320 x 240 pixels resolution. This smartphone support connectivity via Bluetooth, Wi-Fi, Signal Boost (UMA). More over also support for 3G compatible, GPS Orange App Shop, Orange Downloads, Orange Maps, and Orange Games. While for internal memory is 120MB.